The US’ national monuments are under attack – not from a foreign power or aliens, but from microscopic organisms called biofilm. The National Park Service announced biofilm is blackening landmarks around Washington DC, and they’re searching for a way to combat the biofilm and return the monuments to a shiny white state. Biofilm is not only a menace to the Jefferson Memorial, but to monuments and old structures around the world. Angkor Wat, Egyptian monuments, and Hadrian’s Villa have all been victim to the microscopic organisms. 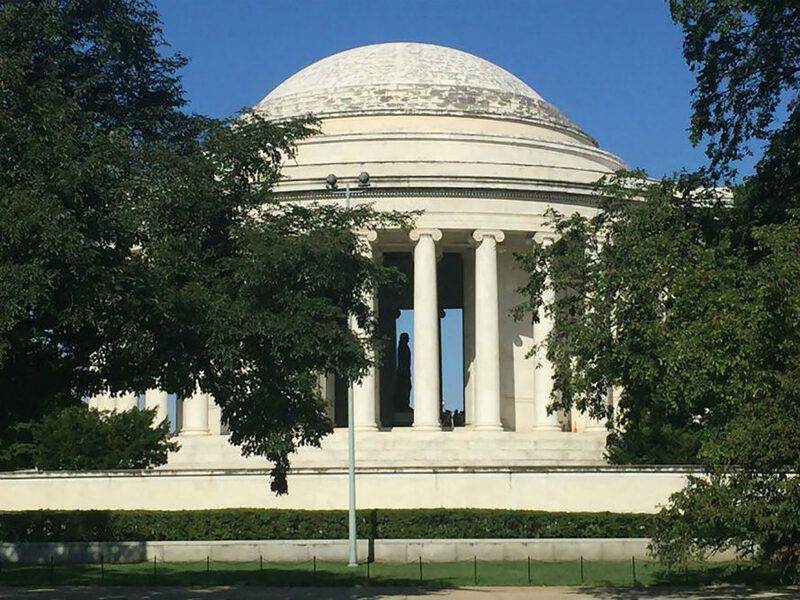 Biofilm can be seen on many Washington, D.C. area monuments, including the Jefferson Memorial’s dome, the Congressional Cemetery tombstones and the Lincoln Memorial. Biofilm love to grow on stone. According to the National Park Service, the Jefferson Memorial’s once-smooth marble blocks eroded over time, creating an ideal environment for biofilm to thrive. The Jefferson Memorial biofilm “became noticeable” in 2006 and continued to grow. In 2014 a coalition of molecular biologists, architects, and conservators started to study the biofilm. Biofilm has been dealt with successfully before in 2011 at the D.C. War Memorial. Now the National Park Service is testing “10 different chemical biocides” along the Jefferson Memorial’s base to see how well they work. They’ll also test out non-traditional methods like laser irradiation. The biofilm issue is particularly bad on the Jefferson Memorial; the organisms can also be spotted on the Lincoln Memorial. The biofilm is blackening the memorials. The US' national monuments are under attack - not from a foreign power or aliens, but from microscopic organisms called biofilm. The National Park Service announced biofilm is blackening landmarks around Washington DC, and they're searching for a way to combat the biofilm and return the monuments to a shiny white state.